2. Term. This Lease shall be for a term of ____________ (__) months commencing _____________ (the "Commencement Date") and terminating _________________. Option to Extend. Tenant, provided it is not in default, has the right to extend the initial term of this Lease for two extension periods, each extension for a period of three years. To exercise its option to extend, Tenant must notify Landlord in writing 180 days prior to the end of the lease term then in effect. If Tenant fails to so notify, Landlord may lease the existing premises to another party. Rent During Options. If Tenant exercises its right to extend the initial term of this Lease, Monthly Minimum Rent for the first three-year extension period shall be $____________ per month due on the first day of each month. If Tenant exercises the second three-year extension period, Monthly Minimum Rent shall be $_________ per month due on the first day of each month. (b) Percentage Rent. The Percentage Rent Rate is six percent (6%). Tenant shall pay to Landlord without demand the amount, if any, by which Tenant's Gross Sales resulting from business conducted in, on, from or through the Premises during each full or partial calendar month of the Lease Term multiplied by the Percentage Rent Rate exceeds the Monthly Minimum Rent payable for that full or partial month ("Percentage Rent"). Monthly Percentage Rent, is to be paid on or before fifteen (15) days after the end of each calendar month of the Lease Term. The term "gross sales", as used herein, means the selling price of all goods, merchandise and services sold in, upon and/or any part of the Premises by Tenant or any other person, firm or corporation, and shall include, but not be limited to, sales or charges for cash or credit regardless of collections, sales by vending devices, including coin telephone, rent income, mail or telephone orders received or filled and paid for at the Premises, all deposits not refunded to purchasers, fees, commissions, catalog sales, and sales by any subleases, concessionaire, licensee or otherwise. Excluded from gross sales shall be returns and refunds to customers and the amount of any sales tax or other excise tax imposed upon such sale and charges (but only if such sales tax, excise tax or similar tax is billed to the purchaser as a separate item). Each sale upon installment or credit shall be treated as a sale for the full price in the month during which such sale is made, regardless of the time when Tenant receives payment from its customer. 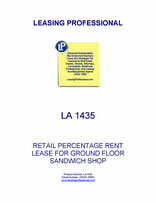 Percentage reports of gross sales are due on or before the fifteenth (15th) of each month during the Term of this Lease. Tenant shall submit to Landlord a written report, in a form prescribed by Landlord, wherein Tenant shall set forth in reasonable detail the amount of gross sales during the preceding month. Tenant shall also furnish to Landlord with each monthly gross sales report a certified copy of each retail sales tax report which the State of _____________ requires of Tenant. Within thirty (30) days after the close of each calendar year, Tenant shall tender to Landlord a written statement, certified by Tenant, setting forth in reasonable detail the amount of gross sales and a computation of the amount of percentage rent payable for each calendar year. All certificates required above shall be by an authorized officer, partner, or the owner of Tenant. Tenant shall keep true, full and accurate books of account setting forth gross sales, together with any other information which will in any way affect the determination of rent payable hereunder. Landlord shall be allowed after five days prior notice, to inspect Tenant's books of account at the Premises and to procure audits thereof by a certified Public Accountant. If in the judgment of such accountant Tenant's books of account are incomplete or improperly reflect the information necessary to an accurate determination of the rents payable hereunder, or if the audit shall show that the reports submitted by Tenant understated Tenant's gross sales by more than three percent (3%) thereof for any year covered by audit, the costs and fees for such audit shall be paid by Tenant as additional rent hereunder. If such audit shall disclose any willful or intentional effort to understate gross sales, then, at Landlord’s option, Tenant may be required to surrender possession of the Premises under the provisions of Paragraph 27 herein. The fixing of a portion of the rent on the percentage of sales of the business to be done by Tenant is for the sole purpose of determining the total rents to be paid by Tenant and does not create a partnership or joint venture relationship between the parties hereto. Landlord assumes no liability hereunder for the operation of the business of the Tenant. d. Espresso, espresso beverages, coffee (whether liquid, whole or ground) and coffee beverages provided the aforementioned is not Tenant's primary business. Tenant shall not occupy or use or permit any portion of the Premises to be occupied or used in such a manner or for any purpose which would increase the cost of insurance coverage upon the Premises, the building or the contents thereof. Additionally, Tenant may not change the permitted use of the premises without Landlord's consent. b. Pre-made, pre-grilled, pre-baked or reheated sandwiches. This paragraph will not apply to lunchrooms or cafeterias provided by other Tenant's in conjunction with their office use. 6. Rules and Regulations. Tenant agrees to comply with any Rules and Regulations attached hereto as Exhibit C, any recorded Covenants, Conditions and Restrictions affecting the Project, as well as such other reasonable rules and regulations as may from time to time be adopted by Landlord for the management, good order and safety of common areas, the building and its Tenant(s). Tenant shall be responsible for the compliance with such rules and regulations by its employees, agents and invitees. Landlord's failure to enforce any of such rules and regulations against Tenant or any other Tenant shall not be deemed to be a waiver of same. 7. Maintenance. Tenant agrees by taking possession that the Premises are in tenantable and good condition. Tenant shall at its expense and at all times keep, maintain, repair and replace the Premises, including but not limited to storefronts, exterior doors and windows, Tenant division walls and mechanical, electrical, sprinkler and other utility systems located within or serving the Premises, together with connections to utility distribution systems, in good condition, repair and order and in accordance with applicable laws, ordinances, rules, regulations and requirements of government authorities and insurance rating bureaus. Tenant agrees to maintain a preventative maintenance contract providing for the regular inspection and maintenance of the heating and air conditioning systems with a licensed mechanical contractor and containing terms and specifications acceptable to Landlord. Tenant shall further keep the Premises and adjoining common areas in a neat, clean, safe and sanitary condition; protect water, drain, gas and other pipes to prevent freezing or clogging and repair all leaks and damage caused thereby; replace all glass and panels in windows and doors of the Premises which become cracked, broken or damaged. Except for the items to be maintained by Tenant outlined above, Landlord will, throughout the term of this lease, maintain in good condition and repair the building of which the premises are a part, the Common Areas, and other building systems outside the premises. Any damage to the premises caused by Landlord's failure to maintain and repair the building within which the premises are located must be remedied at Landlord's expense. Landlord will perform its maintenance duties in such a way as to minimize the adverse impact on Tenant's business on the premises.